With a spot in the finals on the line, our remaining five artists Chris Jamison, Craig Wayne Boyd, Damien Lawson, Matt McAndrew and Taylor John Williams must give the best performances of their lives to stay in the game. Blake Shelton kicks off the show by performing his new song, “Lonely Tonight,” featuring country singer, Ashley Monroe. This heartfelt duet perfectly sets the perfect stage for a night of incredible performances. Carson takes a moment to discuss song choice with Adam, who has picked Michael Jackson’s “She’s Out of My Life,” for Damien to perform and it’s a good match for Damien’s soulful voice and inherent vulnerability. Sitting alone in a single spotlight, Damien sings with both control and intensity earning him a rousing ovation, Blake said that it’s one of the best performances that he’s heard on The Voice stage. Adam pats himself on the back for a great song choice, and commends Damien for living up to the great Michael Jackson. The stage shines in awash of fiery gold light as Craig struts out singing Merle Haggard’s “Workin’ Man Blues,” and he immediately gets the crowd rocking out! Blake Shelton’s got a new star in his hands. FUN FACT: Blake’s favorite holiday dish is his mother’s green bean casserole. Taylor John Williams sings “Falling Slowly,” by The Swell Season, it’s one of Taylor’s favorite songs and he gives it his own special spin and the audience won’t stop screaming. 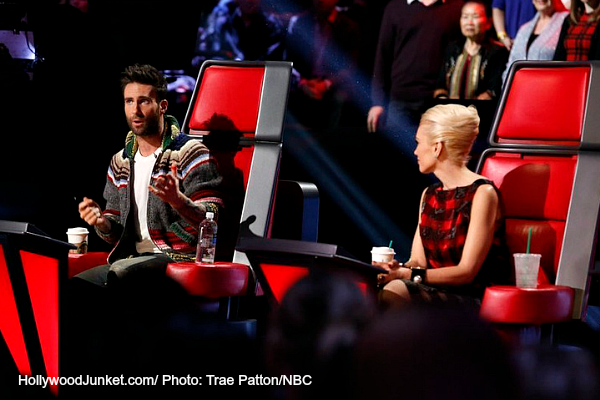 Adam praises his approach and adds that he thinks Taylor’s adorable, watch out shevine. Matt McAndrew hits the stage singing “Make It Rain” by Ed Sheeran, Adam chose this song after hearing it on the TV show Sons of Anarchy. The crowd reaches a frenzy as Matt takes the song on an emotional roller coaster ride that brings the coaches to their feet applauding. Blake said Matt’s performance was Grammy worthy and Adam declares him a frontrunner of the competition. Stepping out in a fitted black leather jacket is Chris Jamison sining “Sugar” by Maroon Five, complete with dancing girls in tow, Chris is the total picture of cool, which turns out to be a coach and crowd pleaser. Damien is back for his encore to sing Paula Cole’”s I Don’t Want To Wait,” and the crowd rewards him with prolonged applause making Adam proud to be part of Damien’s life and career. Matt McAndrew for his second performance sings U2’s “I Still Haven’t Found What I’m Looking For.” Backed by blue light and flashing strobe, Matt puts on an epic performance and the crowd is ecstatic leaving Adam is speechless, the cheering crowd says it all. With the stage transformed into a church and with an orchestra behind him, Craig Wayne Boyd sings George Bennard’s “The Old Rugged Cross,” and brings Gwen to tears for what must be the fifth time of the night. Adam calls the performance brilliant and Craig is clearly blessed. Looking hip in a dark velvet suit, Taylor John steps out into rays of deep purple lights as he sings a dark, dramatic version of “Blank Space,” by Taylor Swift. After the performance, Adam commends Taylor on his knack for “Taylorizing” songs. It’s time for the last performance of the night, by Chris Jamison singing “When I Was Your Man” by Bruno Mars. Chris’ voice fills the room and captivates as the audience sways and swoons. The coaches congratulate Chris on his best performance yet. Tomorrow night we find out who’s going to the Live Finale and a chance to bring back one eliminated Top 12 artist as a Wildcard pick.